I didn’t want to read this book. I resisted it until it had the Pulitzer; then I caved. And once begun, Tartt’s spellbinding tale owned me until I had turned the final page. The story begins in an art gallery, which explodes in a manner reminiscent of 9/11. It kills many people, including Theodore Decker’s mother. I don’t like art galleries. I don’t blow them up; of course not. But they bore me unbearably. I avoid them, and I avoid books that are set there. Theo hasn’t seen his father in nearly a year; for a long time, it had pretty much been his mother and him against Dad, who came and went at irregular times, drank way too much, and was bad tempered. When he left, they were relieved. He never paid a dime of child support, didn’t even leave a forwarding address. Theo’s short, bad memory of Dad’s parents tells us they would make even worse guardians, and his mother’s folks are dead. With whom, then, will he live? The teacher in me engaged fully when the process of dealing with Theo’s loss and custody issues commenced. Every counselor, teacher, and government bureaucrat wants him to confide in them about his feelings, his grief. Talking about it is supposed to make him feel better. But it’s a hot-stove topic for Theo, and they go about it all wrong, face to face, brightly lit rooms with fluorescent lights, and in one horrific case, an entire panel of earnest professionals at a big board-meeting table waiting to grill this one, introverted, shy child. His one hope at first is that the Barbour family will take him in. He’s been skipped a grade in school, and Andy Barbour is his one friend. Together they braved the hazing by resentful older students. The Barbours live quite well, in opulent yet tasteful surroundings. Theo walks on eggshells, avoiding becoming an imposition. It’s awkward; when he needs lunch money or a bandaid, he feels funny asking. But gradually, a consensus seems to emerge; he is good for Andy, and Andy is his mother’s favorite. And just as they are ready to set the lawyers and bureaucratic adoption wheels in motion…Theo’s rotten, irresponsible father turns up to claim him. And there is nothing that Theo or the Barbours can do about it. By the way, I also don’t read books about affluent people. I like regular folks, people who work hard for shelter, food, and other essentials, and a few simple pleasures. And so this book reminded me that for every rule, there is an exception. I don’t read about art galleries or art, and I don’t read about the rich, but I would be much poorer had I not read this book. Now, back to Theodore Decker. Theo has never been out of New York City for more than 8 days, but now he is going to Vegas. He watches horrified as his apartment home, once so secure and comforting, is taken apart, thrown into boxes…and his father takes his girlfriend into his mother’s bedroom, where he hears them rustling through her clothes, the girlfriend giggling over his late mother’s effects. The horror! Ultimately, Theo’s greatest source of consolation, apart from the Barbours, is a furniture restorer. One of the victims of the bombing asked him to take something there with his last dying breath. And in learning to restore furniture, Theo learns to restore himself. There is a fair amount of philosophical musing toward the end of the book, but by then we care so deeply about Theo that we listen carefully. And whereas some of the somewhat nihilistic ponderings went against my grain, I read every word, because I wanted to know what Theo thought. My favorite character in this massive, painterly tome is Boris. Boris becomes Theo’s friend in Vegas, where both of them live the lives of feral children, sometimes having to steal food, and taking terrifying risks of all sorts. Boris is fearless, and 99 percent of the time he is loyal. They are nearly killed together multiple times, but Boris pops up again, time time time and again, to stand by his comrade once more. Those that don’t care for literary fiction won’t like this story. The descriptions were so well done that I sometimes found myself forgetting to breathe. It doesn’t happen a lot, and I read a great deal, but it happened constantly as I read this book. If instead you prefer action, action, action—a book that thinks it’s a video game, perhaps?—then leave The Goldfinch on the shelf for someone else. I got my copy at the library, but I may buy a nice hardcover copy for my daughter at Christmas. It should be in every library, at least among those that love literature. To sum up: simply brilliant. 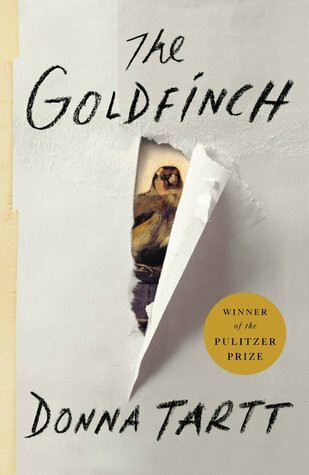 This entry was posted in literary fiction and tagged book blog, literary fiction, suspense, The Goldfinch review by seattlebookmama. Bookmark the permalink.